Chocolate Orange Cheesecake. A luscious two layered cheesecake inspired by Terry’s Chocolate Orange. It’s been popular in my family and on my blog for many years. 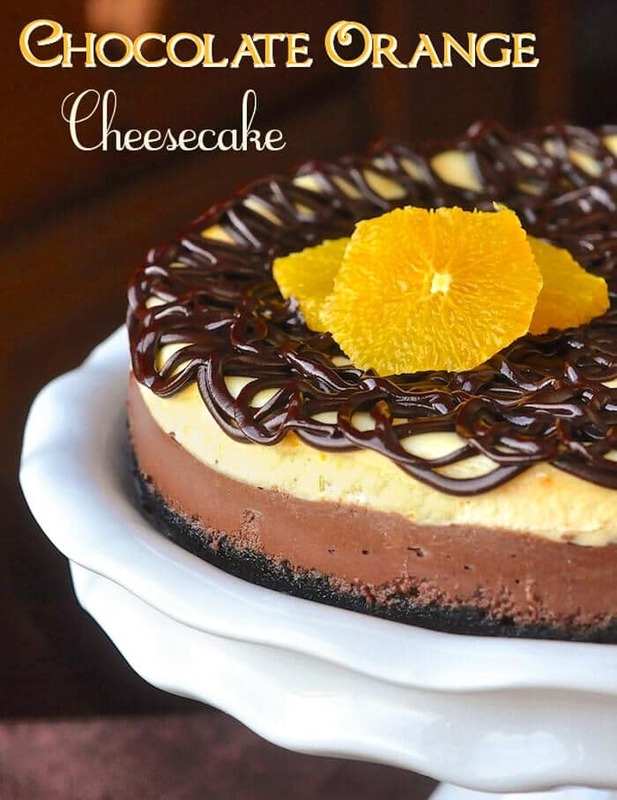 I adapted this chocolate orange cheesecake recipe about 15 years ago around the Holidays. Santa, in his regular generosity, inspired me by leaving that familiar favourite, a Terry’s Chocolate Orange, in the toe of my Christmas sock. 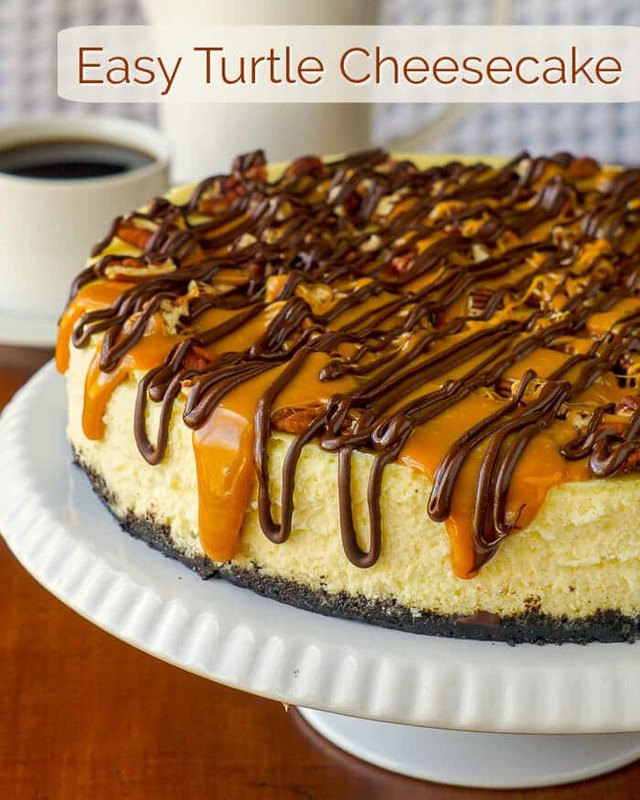 Since then, this recipe has proven to be the most popular of the many cheesecakes in my repertoire. Probably because of the great popularity of Terry’s Chocolate Orange in the U.K., the Brits who have sampled this chocolate orange cheesecake have gone mad for it too. It has made many the repeat appearance at the annual family Christmas feast. More recently, I was called upon to provide something to be raffled off at a fundraiser tonight and thought this might catch the eye of ticket buyers. 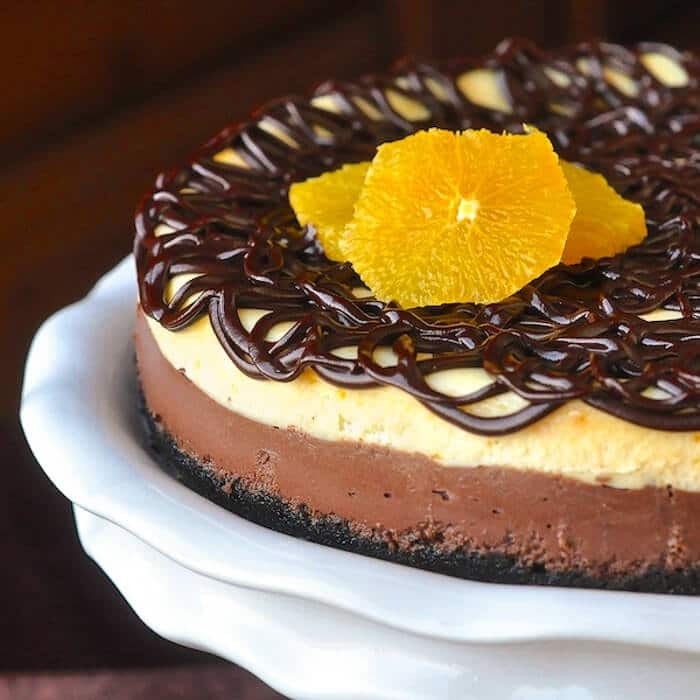 Like this Chocolate Orange Cheesecake Recipe? If you enjoyed this recipe, check out out entire Desserts Category where you’ll find many many more delicious dessert ideas. Chocolate Orange Cheesecake - a luscious two layered cheesecake inspired by Terry's Chocolate Orange. It's been popular in my family and on my blog for many years. Lightly grease the bottom but not the sides of a 9 or 10 inch springform pan. Line the bottom with a sheet of parchment paper for easy release from the pan later, once the cheesecake has cooled. Mix together the cookie crumbs, melted butter and 3 tbsp sugar and press into pan. Cream together the cream cheese and 1 ¼ cups sugar. Add the vanilla extract and whipping cream and blend until smooth. then divide mixture into 2 equal portions in separate bowls..
Pour into bottom of the prepared springform pan. To the second half of the mixture, stir in the finely grated and chopped zest 1 large orange. Carefully spoon this mixture over the top of the chocolate mixture already in the pan. 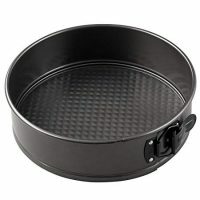 Bake at 325 degrees F for about 60 minutes or until the surface of the cake no longer looks glossy. Remove from oven and immediately run a sharp knife around the edge of the pan to release the cake. Cool completely in the pan. Top with the Ganache glaze. To make the ganache glaze, in a heavy bottomed pot, scald but do not boil the 1/4 cup whipping cream, then melt in the chocolate chips over low heat. Pour over cooled cake or to create Ganache lace, cool slightly and spoon into piping bag fitted with a number 3 tip. Pipe over the entire cake in a circular, overlapping swirling pattern, repeating coverage all over the cake until all Ganache glaze is used. Garnish with orange segments, orange zest curls or orange slices. Looks delish – I can’t wait to try it. Question – do you bake the cheesecake in a water bath? Also, how did you get the deep orange colour? Zest alone wouldn’t be enough… did you add some food colouring or turmeric? I made this on Friday – just like eating a Terry’s chocolate orange – delicious! Thanks. Glad it turned out well for you. I’ve made more of this recipe than any other cheesecake. Everybody loves it. 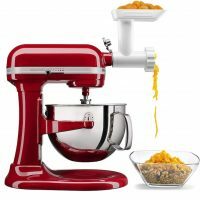 Hello, the recipe says 1 1/2 pounds of cream cheese, how many packages (bricks) would that be or can you break it into cups or some other measurement? I’m looking to try this recipe this weekend and want to make sure i purchase the correct quantities of ingredients. No need to whip it…just pour in and mix. Hello! Is the whipped cream the sweet one sold in cans with a tip? How many packages of cream cheese are needed? How much chocolate for the pie is needed (kg or pounds not squares please)? Please answer I really want to do this pie this weekend, sounds delicious! No not spray whipped cream, the liquid type in cartons in your dairy section. Should be near coffee cream and milk. 3 8 0z bricks of cream cheese are needed. 1 1/2 squares unsweetened chocolate equals 1 1/2 ounces. The cocoa works just as well in my opinion. Yes you should have no problem freezing this cheesecake. How many tbsp of the finely grated zest and of the chopped zest. I need a reply ASAP if possible! You can use a couple of tbsp of Grand Marnier. About a tbsp of finely minced orange zest should do. A little more if you like intense orange flavour. Love your cheesecakes. The Raspberry tuxedo is my favorite and I’ve made it several times. I want to make this one and I’m wondering why this one is not made in a bain marie? Can it be? How would that affect the cooking time and temperature? 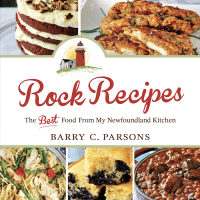 Thanks so much Barry for all your wonderful recipes. Hi there! I love ur recipes. Can I use them both instead? I’ve never used homemade mascarpone. Our whipping cream is 35%, so that’s pretty close. I have made this several times and every time it receives rave reviews. It has become one of my regular go-to desserts to bring to a party. Thank you for a delicious cheesecake! Hi Lindsay, how many ounces (or grams) of Baker’s chocolate did you use? Thank you for your great recipes. I have made many of your recipes and they always taste good. Looking forward to trying the cheesecake. If only there was a conversion of this to make in Instant Pot! A bakers chocolate square is only 1 ounce. Wondering if you bake the crust at all before the filling is put on top of it? Some people do but I don’t find the need.